There was a tropical heat wave of events for The Raver to enjoy and experience over recent weeks, as the sun blazed and temperatures rose during the long hot summer of 2018. First came an unforgettable afternoon when friends and family gathered at a garden party in Sutton to Celebrate the Life of Jon Hiseman (July 21st). Music was played, documentary films shown, speeches made and tributes read to the drummer and bandleader who sadly passed away on June 12th. 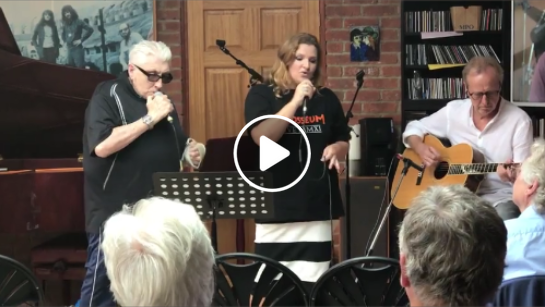 One of the highlights was Chris Farlowe, former vocalist with Colosseum and still recovering from injuries suffered in an accident earlier in the year, singing a blues duet with Jon’s daughter Ana Gracey. Backed by guitarist Clem Clempson they sang Ana’s own composition Blues To Music which also features on Colosseum’s last album ‘Time On Our Side”. 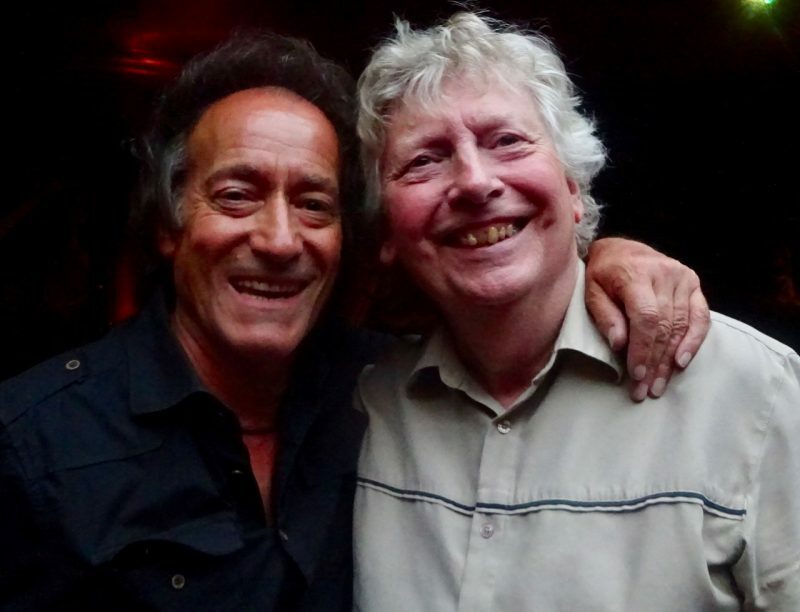 Chris later gave his own amusing spoken tribute to Jon, while Pete Brown and Clem performed a powerful version of the Bruce/Brown song Theme For An Imaginary Western, a Colosseum favourite. Among other guest speakers were Marcus Hiseman, Jon’s son who had organised the event with sister Ana, plus Carmelle Denning, the Raver, Mike Dibb, Paul Brewer, Pete Lemer, Biddy Hayward, Hugh Thompson and an emotional Barbara Thompson. 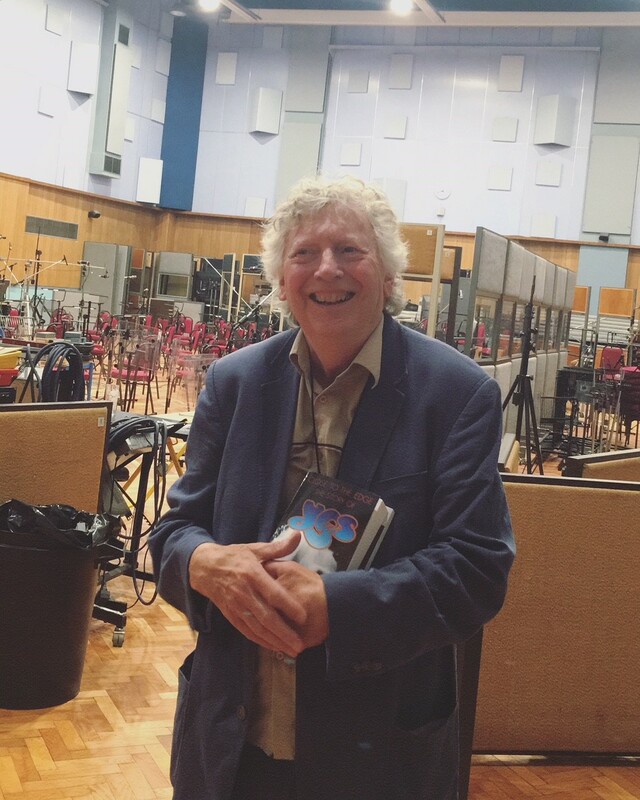 Rod Argent shared his memories of working with Jon on the Variations recording they made together with Barbara, Julian Lloyd Webber and the RPO that became the theme tune of ITV’s South Bank Show. Composer and theatrical impresario Andrew Lloyd Webber, also sent a warm tribute. Among the throng of familiar faces spotted wandering in the house, garden and conservatory (that Jon built) were Dave Greenslade and Tony Reeves, Jon’s oldest friends and Colosseum stalwarts, along with Mark Clarke of JCM and Jill Hiseman, Jon’s sister. The Raver once played drums with Jill in a jazz trio. Lots to talk about! 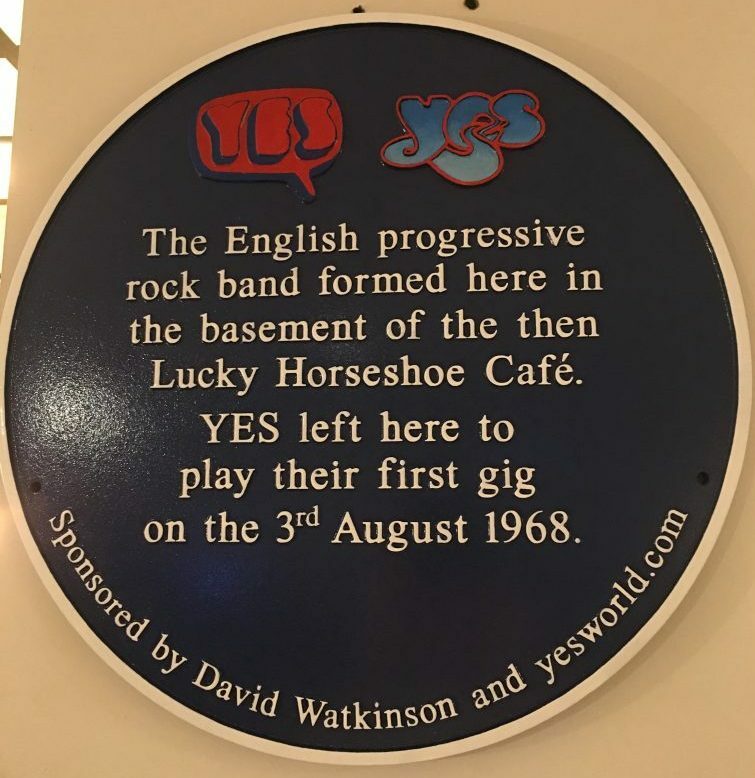 Bill Bruford was on hand to unveil a plaque at the birthplace of Yes, in a sweltering hot basement in London’ West End at midday on August 3rd. The original drummer with the band, now retired, (having ‘downed sticks’ to spend time away from the hectic music biz), delighted the gathering of 40 select fans by making a special guest appearance. The event, organised by the tireless David Watkinson and yesworld.com took place at The Wildwood in Shaftesbury Avenue. It was here in July 1968 that the pioneering group carried out their first rehearsals, when the restaurant was known as the Lucky Horseshoe cafe. And as the plaque’s inscription explained, it was also from the cramped and noisy cellar room, that the band set off to play their first gig on August 3rd, 1968. Among the guest speakers were David, Chris Welch and Tony Squire, who paid a fond tribute to his brother Chris Squire, much missed bass player and singer who was a founder member of Yes along with Jon Anderson. Bill gave a witty, articulate address and was happy to answer the fans’ perceptive questions about Yes music, before pulling the cord to unveil the plaque. Lunch was served, Yes stories told and glasses raised to the memories of Chris Squire and Peter Banks. Good to see rock tour guides Bruce Cherry and Ian Luck amongst the merry throng. The sound of Beyond and Before and I See You seemed to echo approvingly from the very walls of the now historic basement. It was on the same afternoon as the Yes unveiling ceremony that popular music history was celebrated at another much more iconic venue, EMI Abbey Road studios, in St. John’s Wood. It involved a mad dash across town by tube and taxi to get to the destination on time, for a 3 p.m. lecture on Abbey Road: The Studio That Became A Legend. As the London cabbie skilfully wended his way through heavy Marble Arch traffic, we prayed we would not miss the VIP event. After all we remember arriving late for the Beatles All You Need Is Love session at the studio, way back in June 1967, an extraordinary occasion watched by 400 million viewers on the first ever Global TV link up Our World. But hooray, on approaching the hallowed gates of the town house, where graffiti is still scrawled on the wall and tourists from all over the world gather, a kind lady waved me in and presented me with the vital VIP laminate that assured entry. I was the last guest to arrive and she had been about to go leave her post and go home. But security guards led me into a packed studio 2 where the lecture had just begun, ushered me to the only seat now available, in the front row. Two huge screens projected images of Major Glenn Miller, whose band had made their last recordings in that very room in 1944, only days before Glenn flew off to France, never to return. Well that was a piece of history, even before I’d sat down. The fascinating and hugely informative talk was given by two enthusiastic American music producers, Brian Kehew and Kevin Ryan, authors of definitive work Recording The Beatles. They covered the entire 86 year history of Abbey Road from its days as a centre of classical orchestral music recording and a hot bed of technical innovation, to become the home of British popular music in all its trend setting glory – from Mrs. Mills to Freddie & The Dreamers. Oh, and Pink Floyd. We learned this was where stereo recording was patented and early echo chambers perfected, and where microphones, recording desks, tape and digital technology evolved and electronic instruments were utilised to achieve startling new sounds. But it was early newsreel and other archive movie film footage that proved most entertaining, as we saw Cilla Black singing Alfie with Burt Bacharach conducting and Helen Shapiro performing her hit Walking Back To Happiness. We were shown the studio’s collection of pianos and heard how the Beatles devised those familiar chordal introductions on their greatest songs. A modern orchestral filmed performance of Sir Paul’s Yesterday greeted with heartfelt applause. Our lecturers pointed out where the Beatles once sat with all their equipment in the corner of the room making incredible music over an eight year period under the dignified auspices of Sir George Martin. We heard through EMI speakers, exactly how the restored version of Twist And Shout would have sounded on its day of creation. Ringo Starr’s carefully placed snare drum beat in the dramatic coda was a personal highlight. Turns out the record we so fondly remember was done ‘live’ in just one ‘take’. They tried another, but John Lennon’s voice was shot and the first was undoubtedly the best. When once lucrative classical music sessions fell off in the 1980s studio bosses considered converting the room into – we can scarcely believe this – a garage for storing cars. Sanity prevailed and the studio was saved and utilised for recording movie soundtracks for Starwars, Lord of the Rings, Gravity and all the Harry Potter films. Now, wasn’t that a better idea? Today’s EMI Abbey Road habitués Adele and Ed Sheeran were no doubt highly relieved. So was Sir Paul who was back in the studio only days before, still recording and still receiving complaints from the neighbours about the noise. There was just time for a brief studio tour, and then to walk across the famous Abbey Road Zebra crossing with the Repertoire Records gang of Thomas, Andy and Dan, as we headed for the nearest pub. The tarmac was so hot we all kept our shoes on. Following hard on the heels of the Yes and Beatles commemorations, there was another emotional gathering, this time to celebrate the life of Roy Carr, the legendary music journalist who died following a heart attack on July 1st. Jon Newey, editor in chief of JazzWise magazine, organised the event held upstairs at Ronnie Scott’s Club in Frith Street, (on August 8th) a favourite haunt of Roy’s, who was a keen jazz fan as well as pop and rock specialist. Jon revealed in his address to the throng of former NME, Uncut and other magazine staffers, how Roy always claimed to have been born in 1945. But it turned out it was 1939, so he was way older than most of his contemporaries. This would explain his experience, knowledge and ability to bring together special projects like the NME cassette tape compilations, thanks to a huge range of contacts including Beatle Paul McCartney, always available on the telephone. There many speeches and funny stories and the drinks flowed, although not too liberally, at six quid a bottle. It was great to hear a band of young jazz musicians playing two of Roy’s favourite tunes, A Night In Tunisia (Dizzy Gillespie) and Let’s Get Lost (Chet Baker) at the subsequent jam session. Among the faces present to toast Roy were John Altman, Jeff Dexter, David Stark, Paul Pace, Alan Jones (ex-MM and Uncut), Maureen Paton and Norman Jopling, (ex-Record Mirror and author of Shake It Up Baby). Roy would have loved it. Want a toffee?